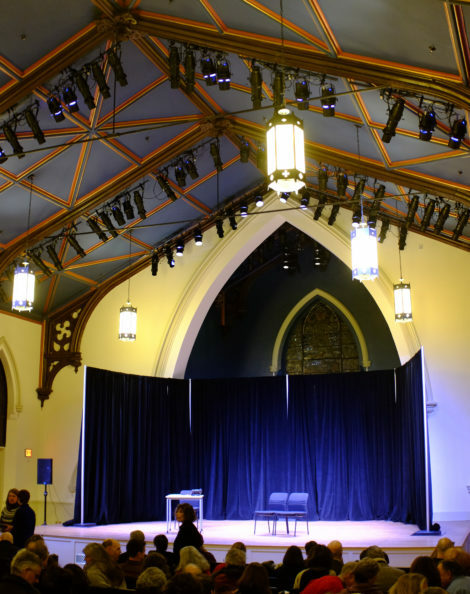 The St. James Place performance hall and stage, the former sanctuary of St. James Episcopal Church, where musicians froom the Curtis Institute of Music in Philadelphia will perform 'Fiddlefest' on Friday, April 14. Great Barrington — Opposite Rittenhaus Square, at 1726 Locust Street in Philadelphia, an unassuming portrait of a woman hangs on the wall in the main building at Curtis Institute of Music. The portrait, painted by Stockbridge artist Norman Rockwell, depicts the school’s founder, Mary Louise Curtis Bok. On Friday evening, at 7 p.m., Saint James Place will host “Fiddlefest,” a program, designed by internationally acclaimed violinist Ida Kavafian, as a showcase for Curtis Institute of Music’s violin students. Sally Harris of Saint James Place lobbied enthusiastically to make Great Barrington a stop on the Nina von Maltzahn Global Touring Initiative of the Curtis Institute of Music; students traveling to Great Barrington from Center City, Philadelphia — for the third time in as many years — will not only be part of the inaugural event both hosted and produced by SJP, but will also have a chance to reconnect with the iconic depictions of Americana — made famous by Rockwell — albeit foreign to them save for the connection to their school’s genesis. The newly renovated Saint James Place, the cultural center situated at the southern entrance to Main Street, is proud to bring Curtis to the Berkshires. Said Harris, “We felt our community of music connoisseurs would really appreciate this special opportunity to hear the sound of violins soaring in the hall of Saint James Place with its superb acoustics.” SJP opened earlier this year after extensive restoration that included the addition of first-class amenities and production capabilities. For Harris, who “is not a musician but an admirer of musicians,” bringing the Curtis students to Great Barrington was a logical step to complement their process of becoming an institution at SJP. The model for their nonprofit — built around no resident theater, arts company or church — was novel and its survival ultimately dependent on what goes inside. ‘Fiddlefest’ participants from the Curtis Institute of Music. Prestigious groups such as Aston Magna, Berkshire Bach and Close Encounters with Music either began in or had very early connections to St. James Episcopal Church, resulting in their respective histories being deeply rooted there. In order to support the mission of SJP — to preserve and repurpose the buildings for use as a permanent home, creative hub and year-round quality performance venue for cultural and educational nonprofit organizations — the Harrises were tasked with finding opportunities to host musical talents in their state of the art facilities with wonderful acoustics. The connection between Curtis Institute and the Harrises began several years ago, at an event in Philadelphia honoring Curtis Chairman Emeritus H. F. “Gerry” Lenfest, a longtime patron. Sally and Fred Harris were in attendance, where they heard Curtis students play, and Sally remembers it being, “spectacular, really impeccable.” The Harrises, deep in the throes of crafting a vision for SJP, invited the Curtis musicians to visit Great Barrington on their way to Nantucket in the summer of 2014. Their eventual connection with Roberto Díaz, President and CEO of Curtis, resulted in a collaboration between SJP and Curtis that began in the Harris’ living room. Since founding Curtis on Tour eight seasons ago, Mr. Diaz has taken the program to North and South America, Europe, and Asia, performing chamber music side-by-side with Curtis students and other faculty and alumni of the school. An embodiment of the school’s “learn by doing” philosophy, it offers students real-world, professional touring experience alongside celebrated alumni and faculty. In addition to performances, musicians offer master classes, interactive programs, and community engagement activities while on tour. Curtis on Tour fulfills the vision that Curtis be known both nationally and internationally, not just in Philadelphia. For Díaz, in particular, his group’s visit to the Berkshires is a sort of homecoming thanks to his affiliation with Tanglewood and the Boston Symphony Orchestra where he was a member under Music Director Seiji Ozawa. This portrait of Mary Louise Bok was painted by Norman Rockwell (1894 –1978), the celebrated American illustrator and painter who for more than four decades produced cover illustrations of American everyday life for The Saturday Evening Post. The Curtis Institute of Music opened on October 13, 1924. It fulfilled the fondest dream of Mary Louise Curtis Bok, the only child of Philadelphia-based Louisa Knapp and Cyrus H. K. Curtis, whose Curtis Publishing Company produced two of the most popular magazines in America: The Saturday Evening Post and The Ladies’ Home Journal. Curtis’s rare tuition-free policy was established in 1928 and to this day provides merit-based full-tuition scholarships for all Curtis students, undergraduate and graduate alike. Students continue to be accepted for study at Curtis solely on the basis of their artistic talent and promise. Their exclusive acceptance rate is just 4.8 percent as compared with 7.2 percent at Juilliard and 13 percent at Eastman. Proceeds from the ticket sales for this concert will go directly to defraying the costs associated with the Curtis on Tour stop in the Berkshires. This includes the feeding and lodging of the student musicians while they are here; it also includes a trip to the Norman Rockwell Museum in Stockbridge — perhaps the most anticipated (and requested) component of the Great Barrington stop — where students otherwise unfamiliar with Rockwell delight in seeing that the subjects of his paintings were in fact those living and working in Stockbridge. There is no cost to the musicians, or the school, for embarking on this touring circuit. To purchase tickets visit the Berkshire Edge calendar, SaintJamesPlace.net or the Mahaiwe Box Office on Castle Street, Wednesday through Saturday, from 12 p.m. to 6 p.m.